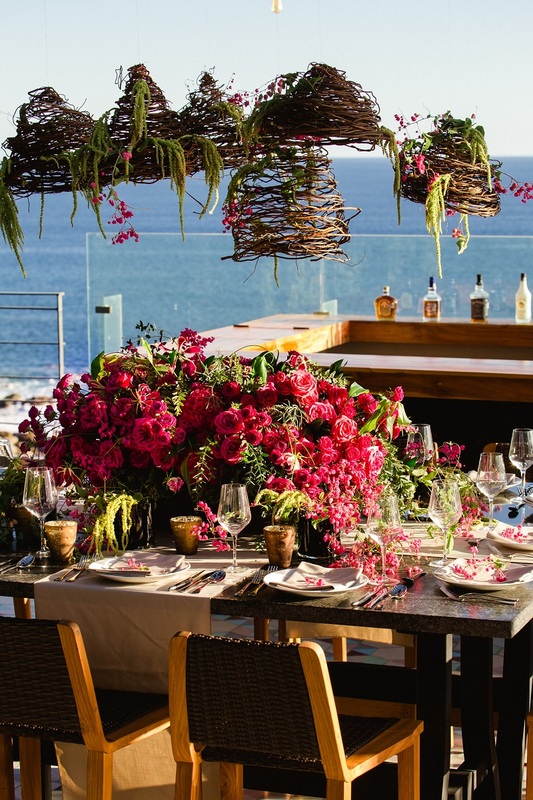 AS WE SHARED ON MONDAY, YOUR LOVE STORY BEGINS with a romantic seaside wedding ceremony on the Upper Terrace of The Cape, a Thompson Hotel in Cabo San Lucas. 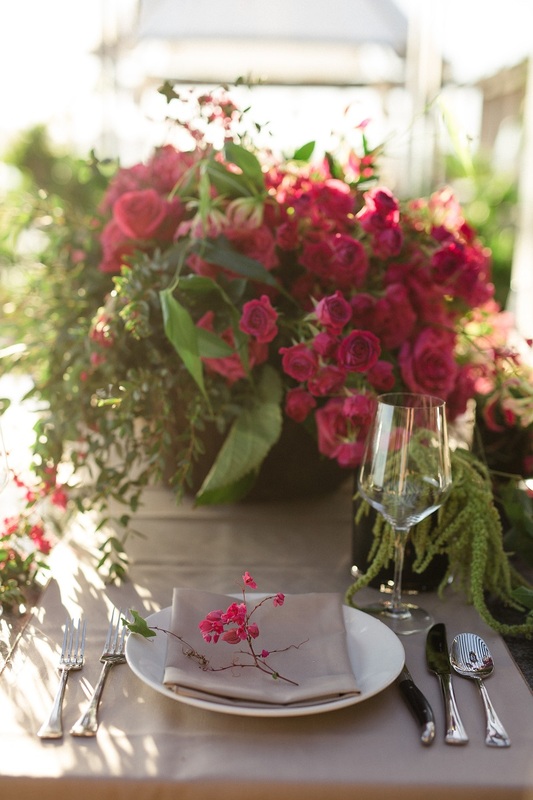 But in Part 2 of our week long focus on weddings at The Cape, the story continues with this intimate wedding tabletop we designed on the hotel’s stunning Rooftop. 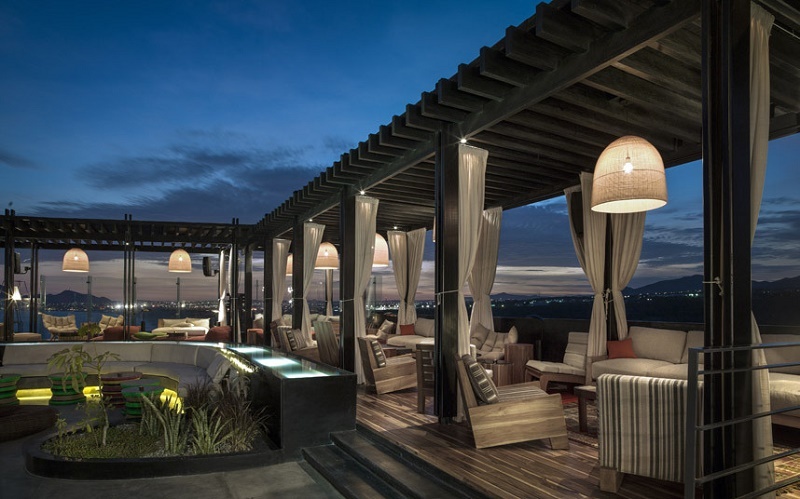 THE ROOFTOP AT THE CAPE offers unbelievably gorgeous sunset views from its multi-leveled open-air garden terrace. 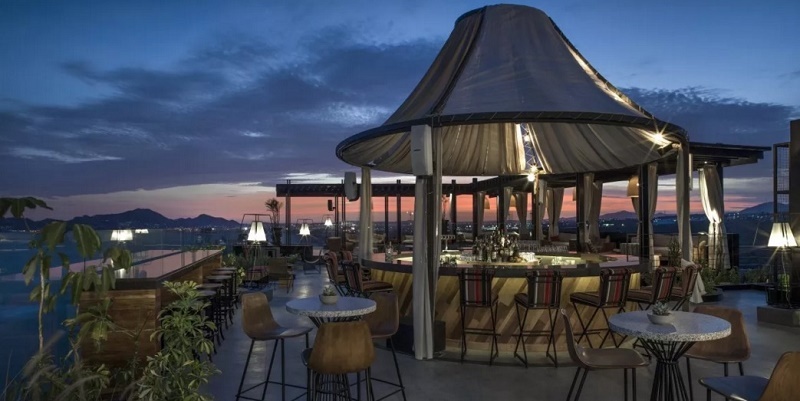 There are also sweeping views to downtown Cabo San Lucas and El Arco, Cabo’s Golden Arch. 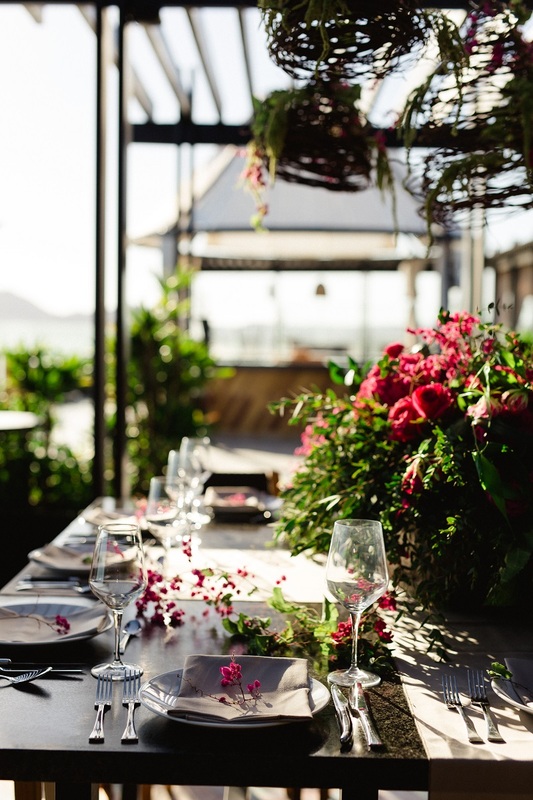 The entire rooftop terrace is something to see, and, without question, an unforgettable location for a wedding celebration, large or small. We can imagine long dinner tables under the pergolas, energetic dancing under the stars, with guests enjoying cocktails around the central bar. INCREDIBLE! 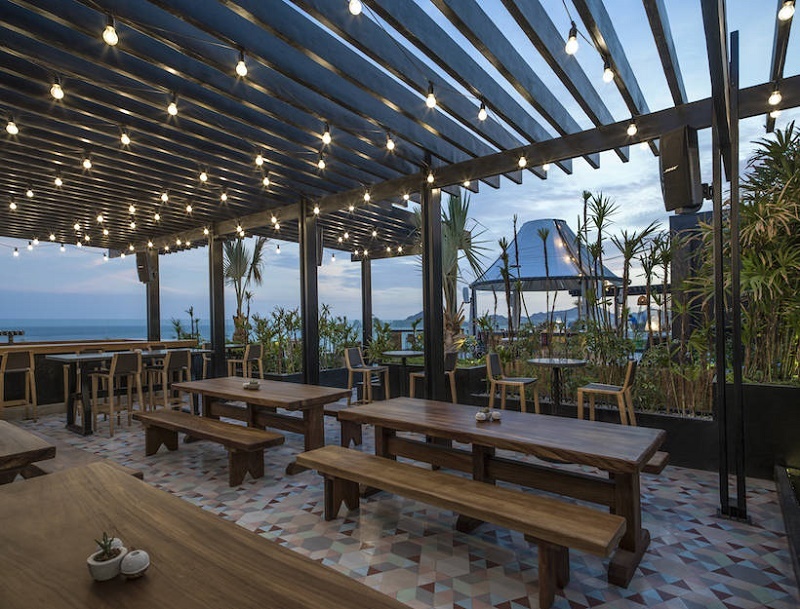 BUT THE LUSH GREENERY, vintage-inspired lighting, and cozy modern pergola of the Beer Garden was the ideal setting for our first dinner table design. 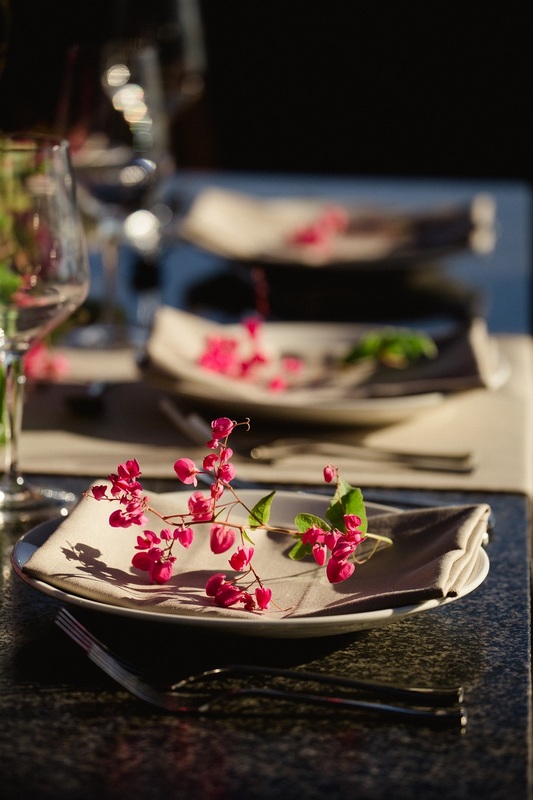 Private dining for a smaller wedding, perhaps? We think so! 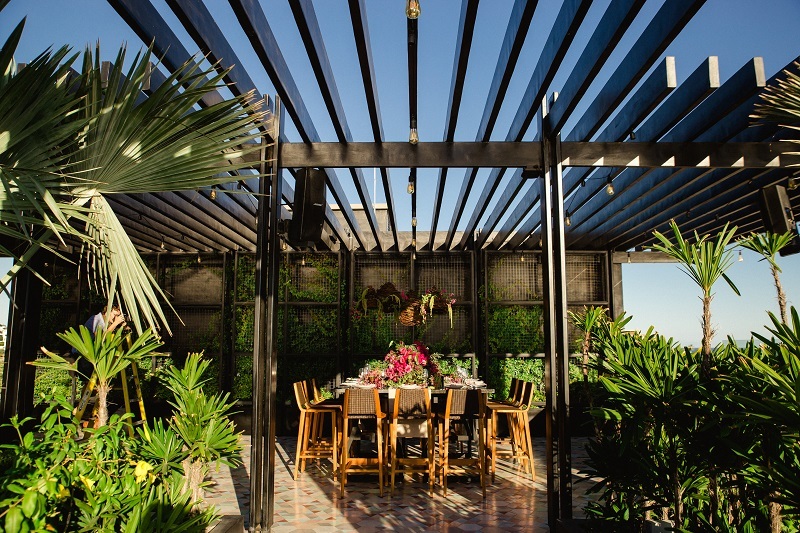 As you can see, the views are amazing but in the Beer Garden your party is embraced by contemporary garden walls and open trellises too. 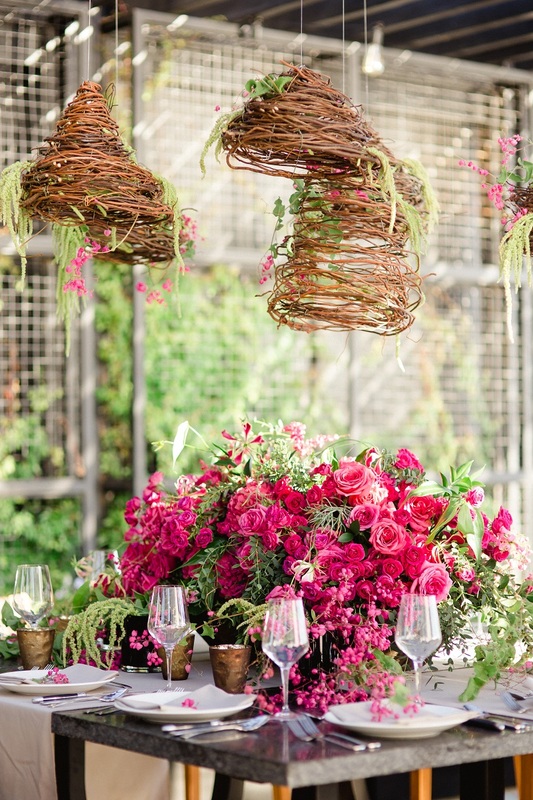 We also loved that the slatted pergola ceiling gave us the opportunity to suspend some of our natural floral lamps low over the table in a decorative grouping. Light and airy, with plenty of beautiful big blue ocean views behind them! 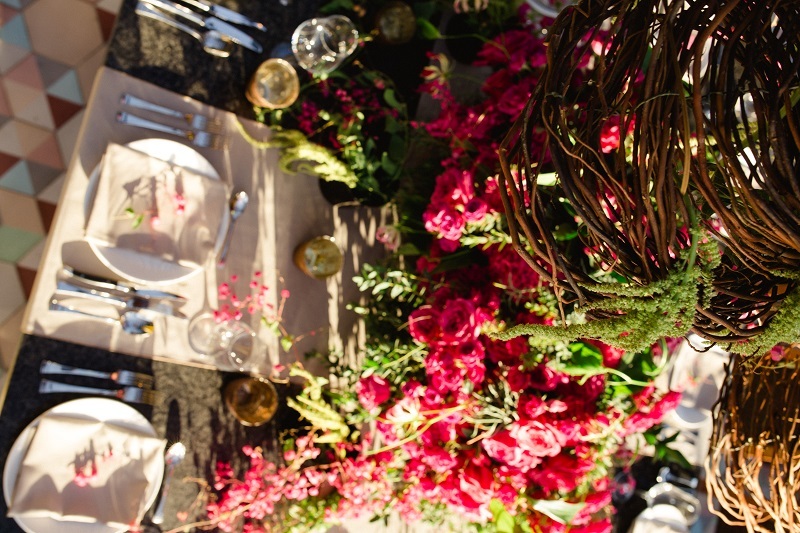 NATURAL AND ORGANIC in tone, our floral tablescape was inspired by the beauty of Baja. 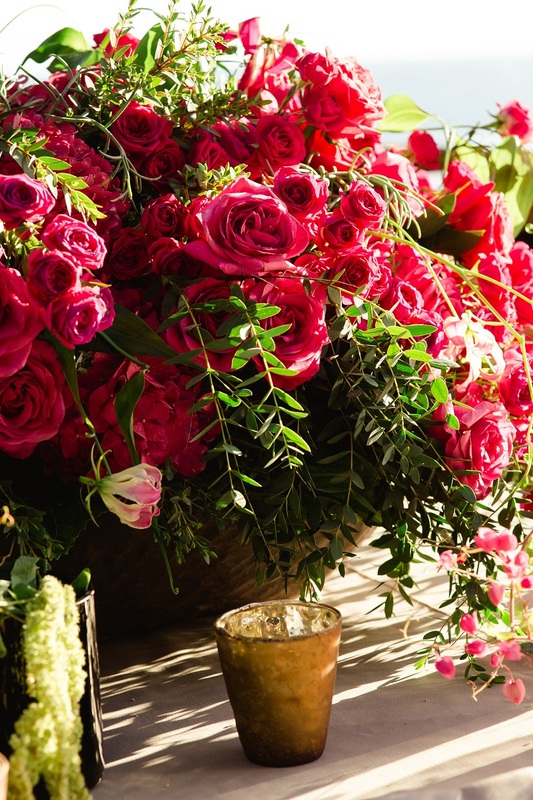 Natural elements such as grapevine and Amaranthus enhanced loose layers of rich red roses and delicate Gloriosa lilies. 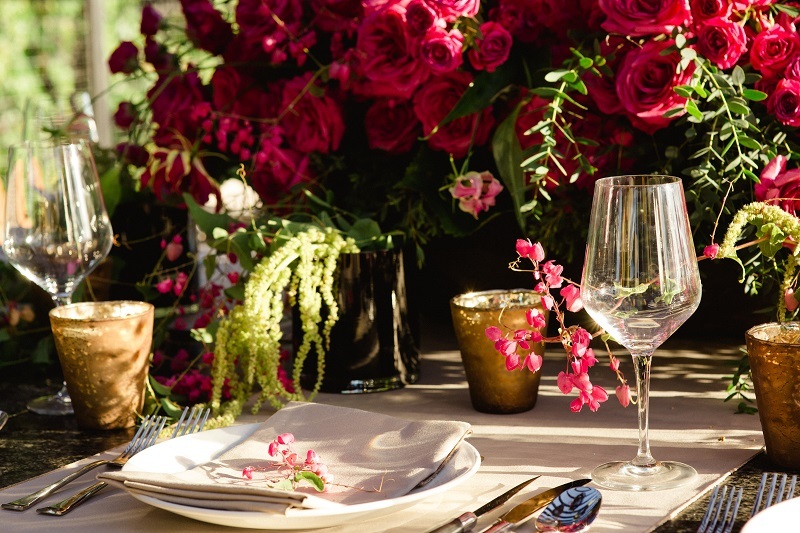 Weathered amber votives, nubby raw linen fabrics and transparent glass stemware completed the setting for an overall modern garden statement. Elegant, relaxed and stylish, if we don’t say so ourselves! 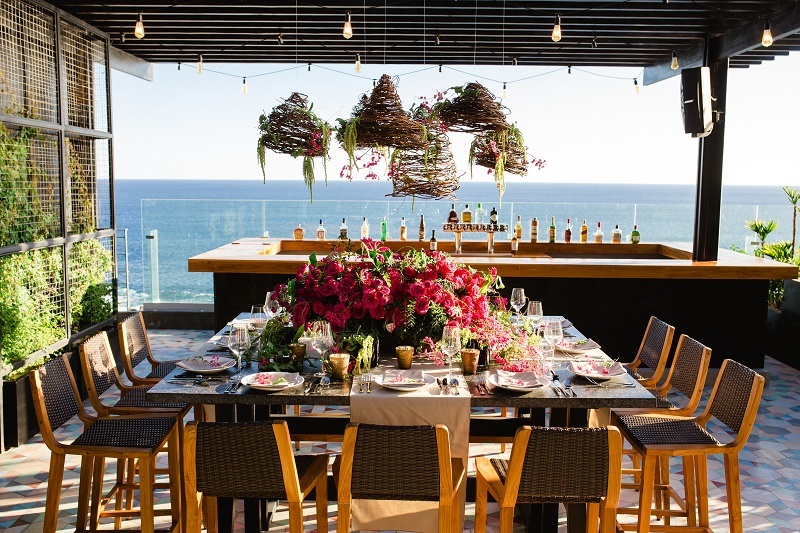 The perfect complement to the existing architecture and environment, you too, could enjoy for your very own wedding at The Cape! 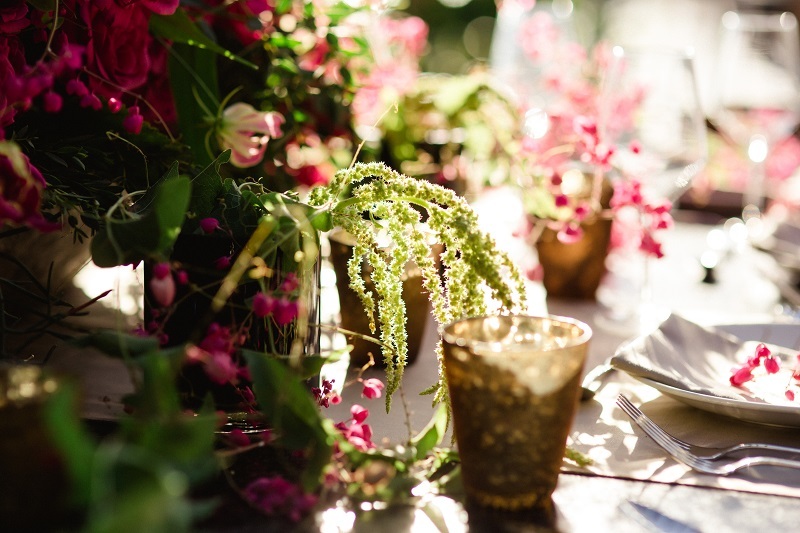 Even more wedding inspiration at The Cape will follow, please join us again on Friday! 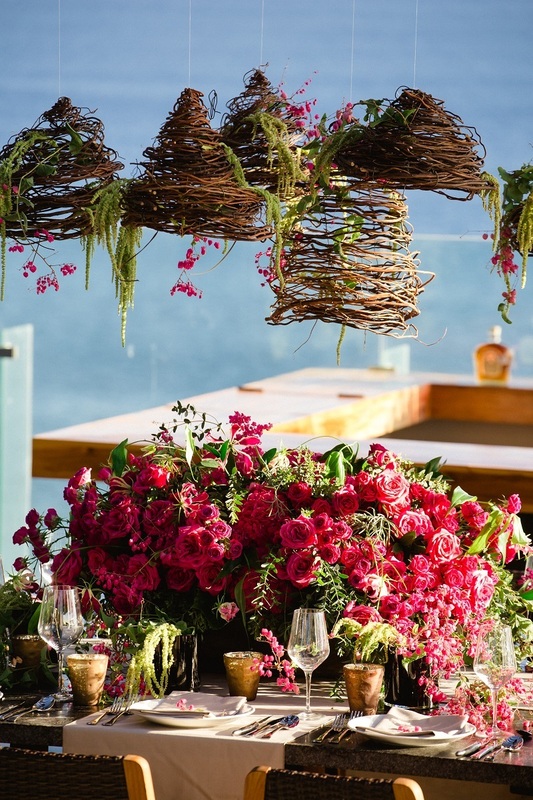 And take a look our Wedding Ceremony Inspiration at The Cape if you missed it.